The Courtyards at Homestead Road is a maintenance-free community in Chapel Hill, North Carolina. Upon completion, the community will have 63 ranch-style homes. The Courtyards at Homestead Road will be a private retreat, surrounded by today's modern conveniences. The location is adjacent to the Carolina North Forest Nature Conservancy area with miles of walking trails and 750 acres of woodlands to enjoy, it is walking distance to the Seymour Senior Center, and less than one mile from Homestead Park, less than five miles from UNC Chapel Hill. The community centerpiece for social, recreational, and fitness activity, the clubhouse will provide homeowners with 2,731 square feet of amenities. It will feature a common room where residents can play cards or chat with neighbors, as well as an exercise room. Outside will be an outdoor pool where residents can stay in shape swimming laps or just cool off and relax. Surrounding the pool will be a patio with lounge chairs for a relaxing day. The Courtyards at Homestead Road will also feature a community garden to promote a healthy and sustainable lifestyle in your own neighborhood. Epcon started construction on The Courtyards at Homestead Road in 2015. Upon completion, the community plans to include 63 homes. These homes come in floor plans ranging from 1,619 to 2,769 square feet of living space. They have two or three bedrooms, two to three bathrooms, and a two-and-a-half car garage. These homes include features like gourmet kitchens, high ceilings, and private, outdoor courtyards. Maintenance-free living means you can enjoy the benefit of owning your home without the perpetual stresses of exterior maintenance. Homeowners can relax and live a life of leisure knowing a professional association is handling all their home’s exterior upkeep including yard work, landscaping. Homeowners can spend their free time swimming, gardening, and community events. The Courtyards at Homestead Road is situated in Chapel Hill, NC and is located just a few minutes from the UNC Chapel Hill campus and historic Franklin Street. Take a short drive to the neighboring town of Carrboro's to check out the blossoming art scene or the Carrboro Farmers Market. 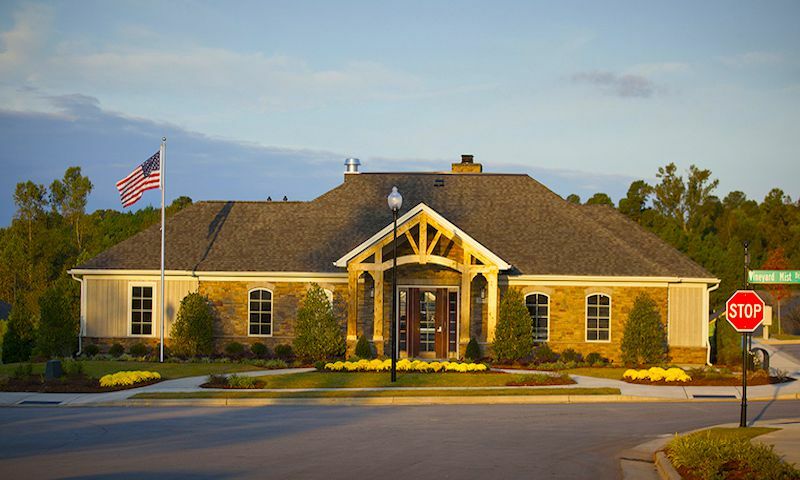 The community neighbors Carolina North Forest, a large, natural space featuring walking trails and a lake. The area also has various shopping centers like The Shops at Eastgate and Hope Valley Commons. Residents can also visit the nearby Museum of Life and Science, Durham Performing Arts Center, and the Ackland Art Museum. There are also various golf courses, medical centers, and churches in the area. The Courtyards at Homestead Road is a short drive from I-40 and from there Raleigh is less than an hour away. Those looking for a vacation can use Raleigh-Durham Airport. Those looking for a quaint, yet active retirement in Chapel Hill should look no further than The Courtyards at Homestead Road. Clubhouse - 2,731 S1. Ft. - Coming Soon! There are plenty of activities available in The Courtyards at Homestead Road. Here is a sample of some of the clubs, activities and classes offered here. These ranch-style homes come in floor plans ranging from 1619 to 2769 square feet of living space. They have two to three bedrooms, two to three bathrooms, and two-car garages. These homes include features like gourmet kitchens, high ceilings, and private, outdoor courtyards. 55places.com is not affiliated with the developer(s) or homeowners association of The Courtyards at Homestead Road. The information you submit is distributed to a 55places.com Partner Agent, who is a licensed real estate agent. The information regarding The Courtyards at Homestead Road has not been verified or approved by the developer or homeowners association. Please verify all information prior to purchasing. 55places.com is not responsible for any errors regarding the information displayed on this website.